I’m always interested in tinkering with alternative audio usage of my Raspberry Pi devices. As standard, I’m using them as Squeezebox substitutes, running the minimalist OS piCorePlayer, though I’ve also tried Squeezeplug and Raspbian for this. Rune Audio, which I think is derived from RaspyFi as a fork at the time RaspyFi became Volumio (though I may have that the wrong way round), recently released a version 0.3 beta for the Raspberry Pi, so (being naturally curious) I decided to try it out. 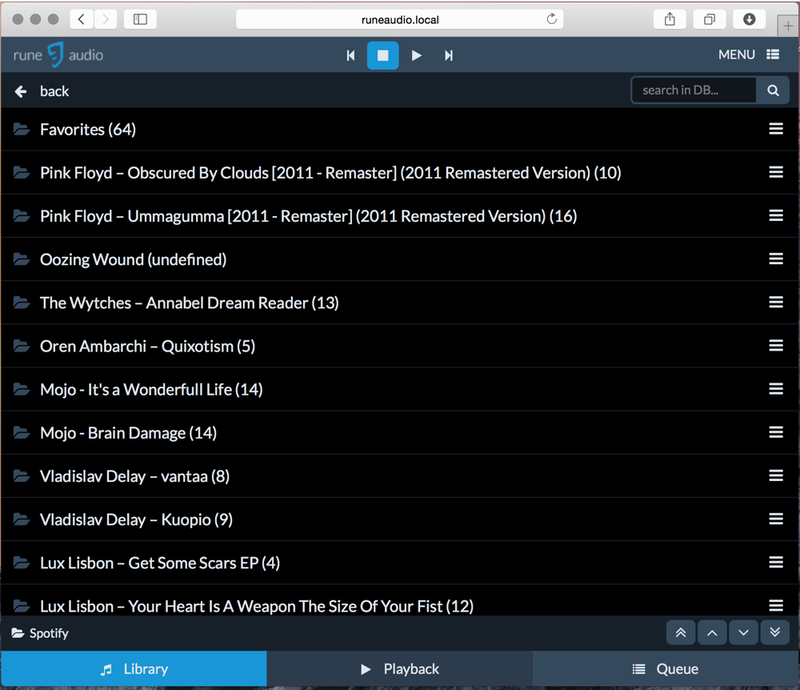 Rune Audio is managed via a web browser. The picture above shows what the main interface looks like. 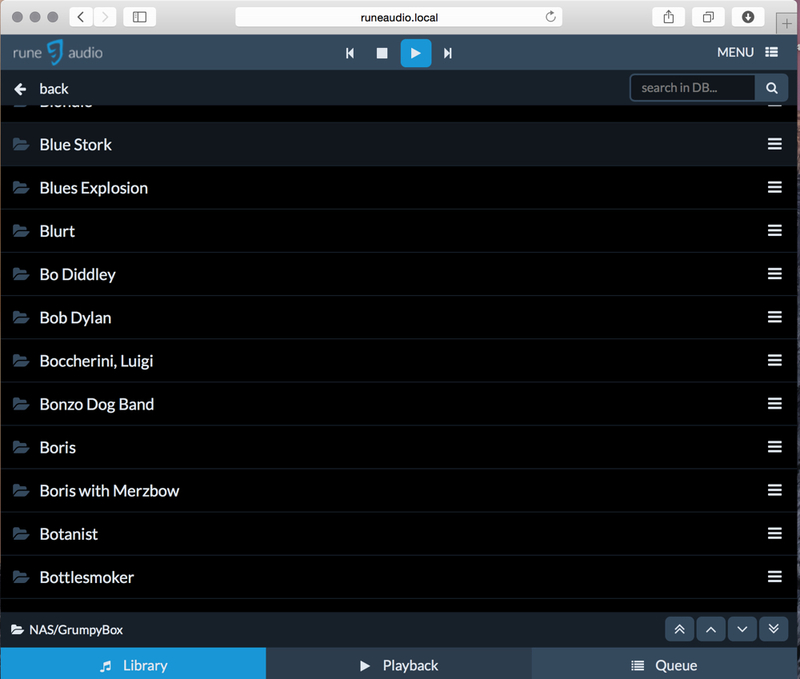 The bar at the bottom allows you to switch from Library to Playback or Queue (pretty self-evident what those are). Image art is centre stage, with the progress wheel on it’s left (big number is elapsed time, smaller is track length), while on the right is the software volume control. The play controls are a little counter-intuitive – this is a screengrab while a track is playing, and I would have expected the play symbol to have been replaced with a pause symbol. Finally, the Menu link at top right is where you access most of the setup functions. Installation is trivial – just download the zipped image file, unzip it and burn the card. After booting the Pi, it’s pretty straightforward – in principle at least – to get the device working. All configuration is done via Rune’s web interface to its Arch Linux-based OS, called Rune UI. 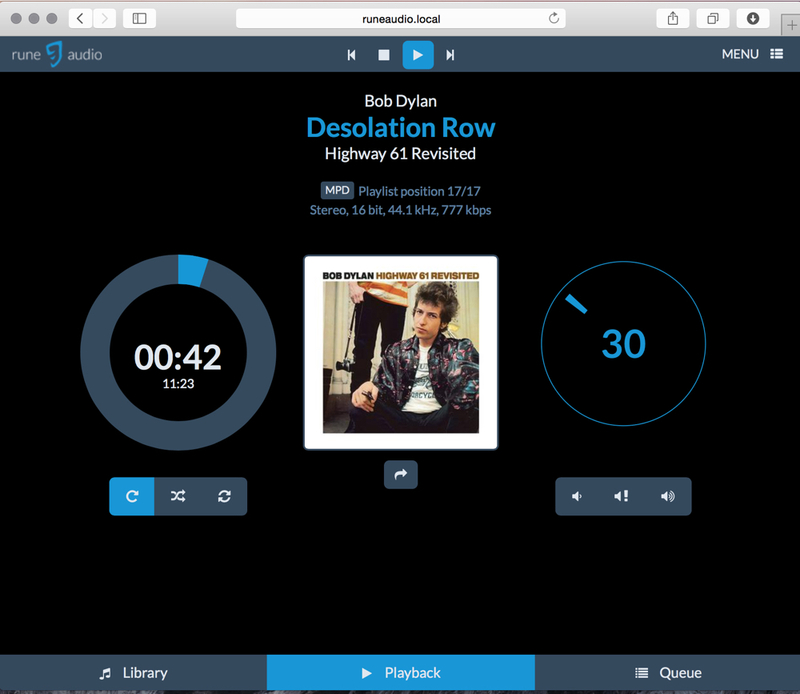 You can reach this by pointing a browser at runeaudio.local or at the device’s IP address. Despite the fact that the majority of settings (such as the USB DAC) are setup by default, I had quite a few issues getting Rune Audio sorted, and at least some of these are down to my ignorance of how Rune UI and its underlying system work. In my own defence, the documentation pages are a little empty at the moment. 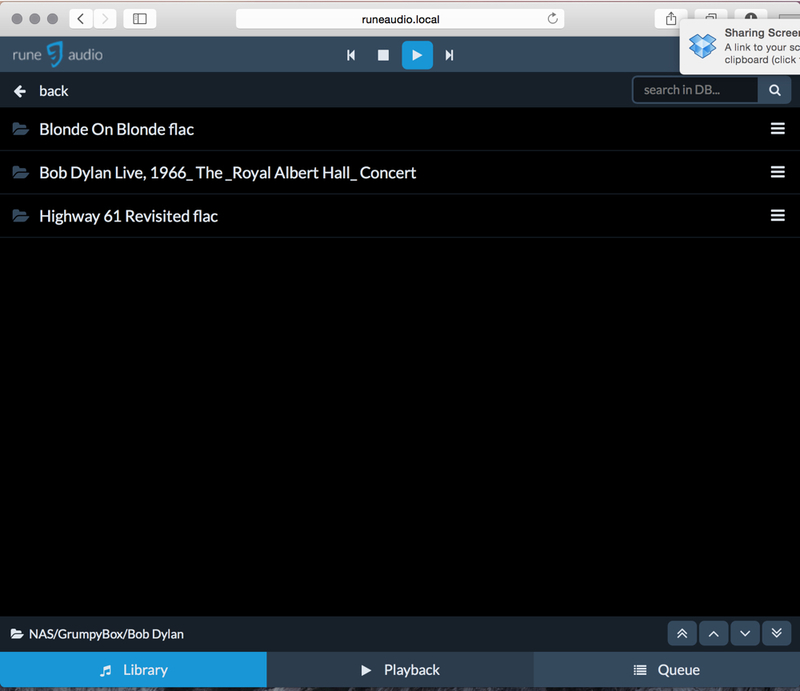 For example, music playback of files located on local or NAS drives uses MPD (Music Player Daemon), while you seem to need to switch to a separate music renderer to play Spotify streams. 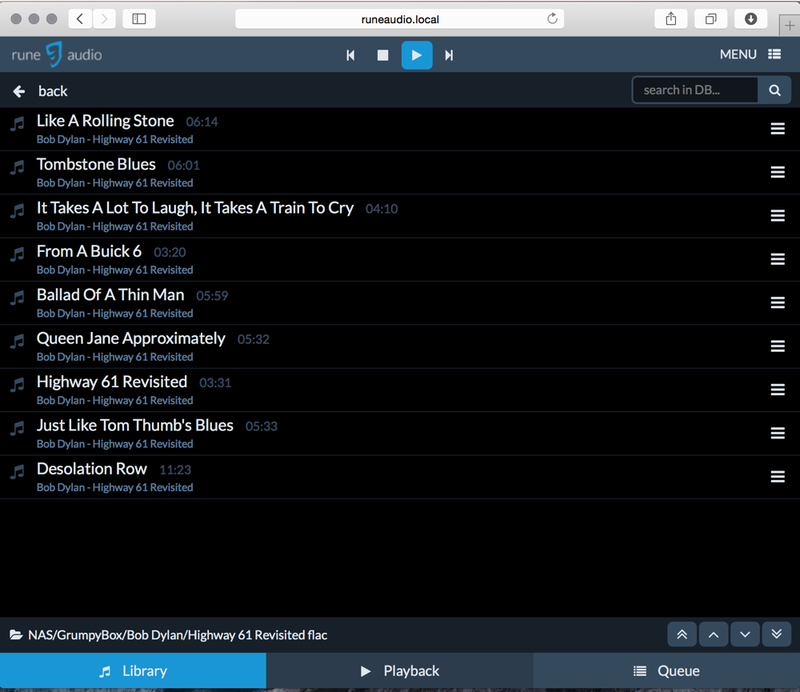 My first issue was persuading RuneAudio to mount my NAS, which is a QNAP device holding about 500Gb music files – a shade under 20,000 tracks, mostly a mix of flac and mp3 files, though with a few alac and wav. These files are all tagged in a way that satisifies Logitech Media Server (LMS), which I have running on the NAS, and feeding several Squeezeboxes and allied devices. In the end, this seemed to work once I’d created a mount folder under /mnt/MPD/NAS – I did this on the command line after logging in via a terminal on my laptop. Essentially, you go to Menu>Sources and choose Network or USB mounts. I found I couldn’t make my NAS connect via NFS, and went for SMB/CFS. Once the NAS was mounted, I needed to have MPD scan the folders of music and generate the database that’s used to navigate the music collection. This scan took ages on WiFi, around 2h for my 20,000 or so tracks. It’s quicker via ethernet. You navigate between the Library, Playback and Queue screens using the buttons at the bottom of the screen. 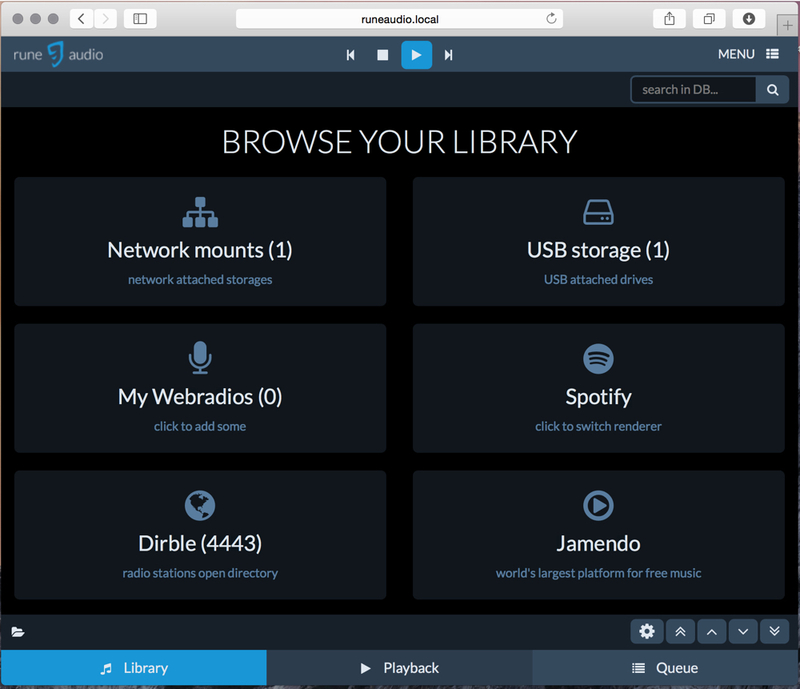 The Library screen shows six options, where you can select to play music from files on a NAS; an attached USB storage device; Spotify (you need a Premium account for this); Jamendo (described as the World’s largest platform of free music – I haven’t tried this); My Web Radios (I haven’t tried this yet); and Dirble, which is apparently another radios stations thing. Note that under Spotify it says “click to switch renderer” – this turns out to be significant. If you select the NAS option, you can select the NAS you want to attach to. I presume this can allow several NAS devices to be used. After this, the music collection is organised in hierarchy, as expected, of Artist > Album > Tracks. Oddly, the Artist and Album names seem to follow folder names rather than the tags in the files. I’m not sure whether this is how MPD is supposed to work, but it seems a little clunky compared with LMS. LMS also offers quite a few options for browsing and searching the music collection which Rune UI does not. This may be because Rune is a relatively new project, or perhaps because the developers are keen to keep a straightforward UI. …but the actual song file tags appear to be properly used. Once you reach your artist, album or track, you can add it/them to the playlist by clicking the symbol of three horizontal lines over on the right hand side of the window – several options are offered (including the option to update this folder). Overall, the Rune UI offers really rather nice and clean interface. The volume control (you need to choose software volume control in the MPD settings screen) can be a little slow to respond. And I do question the player controls at the top of the main windows. This shows buttons with the classic previous; stop; play and pause; and next symbols. Strangely, the play/pause button shows the currently selected function, rather than the option available on the next click. At this point, I decided to switch to Spotify. I’d already entered my account details in the Settings page. It turns out that when you select Spotify in the Library screen, up comes a pop up thriugh which you can change renderer from MPD to Spotify (there are a couple of other options which I haven’t tried yet). You need to do this to get to Spotify. Once in Spotify it’s really easy to select your playlists. Hoever, it seems to me that the software volume control doesn’t work when you’re using the Spotify renderer. I was initially baffled as to how to switch back to the NAS – just going to back to the Library screen doesn’t work – the selection of NAS is just dead. I puzzled over this for a while, before I realised that I needed to click on a small MPD button on the Playback screen – this is just above the album art – before going back to the Library screen. This brings up the same renderer screen as appeared when Spotify was first selected. Choose ‘MPD’, and after a while the setting is changed. Look out for the little popup notification window. If you have a playlist of tracks located on the NAS that you’ve not completed, it will resume. Anyway, once you’ve returned to MPD you can go back to the Library screen and navigate the music on the NAS. Useful tip: there are some good functions available at runeaudio.local/dev if you get the system stuck. There’s also an option to update the system from github. Next up, I want to try getting Rune to run the Wolfson DAC card, as among other things it’s supposed to have a hadware volume control – supposed to be OK out of the box, but I’ve not had too much luck so far. Postscript: 24h after getting all the above to work, the RuneAudio player can’t mount the NAS folder. So I’ve reverted back the PiCorePlayer on the LMS system, at least for the time being.